And maybe they never truly were the best team in the NFC. But in any case, that discussion is over now. The Giants had a chance to win last night, sure. But the mistakes kept coming and coming — some we hadn't seen before and some from the usual suspects — the result of which was a 27–17 loss in the much-awaited Sunday night matchup in Philadelphia. Where to begin with the mistakes? With Ahmad Bradshaw, who fumbled again — and came awfully close to a second fumble, but was saved by video review? (Did Bradshaw's causing Asante Samuel's fumble absolve him of his football sins? Not really.) Or with Eli Manning, who threw three picks (albeit one in the closing seconds) and made the inexplicable decision not to slide feet first after running for a first down with the Giants on their last-gasp drive in the fourth quarter? Matt Dodge's continued adventures? 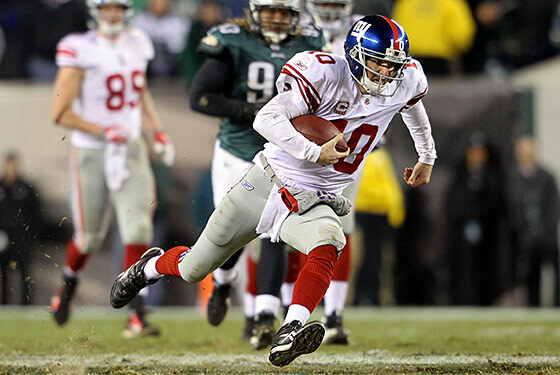 Lawrence Tynes's kick out of bounds after the Giants took the lead in the fourth? Some mistakes hurt more than others, to be sure, but together they exposed a lot of problems for a team that just not long ago crushed Seattle for its fifth straight win. If you're still counting, the Giants have now turned the ball over 30 times in ten games this year. It's hard to finish atop a division, or a conference, or even a wild-card battle, with numbers like those.